Over the past few years several books and articles have come out on the topic of differentiating instruction for students with various needs. Many of these works have been helpful and teachers are more aware than ever before of the need to develop differentiated learning environments for students who are not well served by the mainstream school experience. And yet the topic of differentiating instruction as it pertains to academic language development for English language learners (ELLs) is still scarcely addressed and poorly understood at a time when the number of ELLs has surpassed 5 million across the United States. Hence my excitement when I read Shelley Fairbairn and Stephaney Jones-Vo's guide written for all teachers who work with ELLs. I have been hoping someone would take the time to write a resource for teachers that clearly articulates the many needs ELLs have, but more importantly, goes the extra step and provides examples that teachers can follow as they differentiate language expectations in diverse classrooms. 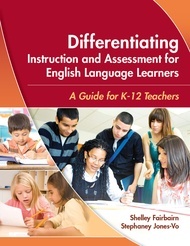 Differentiating Instruction and Assessment for English Language Learners is an important resource for teachers precisely because it provides charts and activities that are easy to understand and return to long after an initial reading. At WIDA we often talk about illustrating the linguistic pathways ELLs need to be successful in all their academic subjects. This guide makes a significant contribution to recognizing and differentiating for ELLs' growth along a path from the beginning through the more advanced levels of proficiency. The most striking features are prose that is thorough yet "readable", the true-to-life scenarios of students and teachers, the focus on classroom assessment strategies, and the connections to TESOL and WIDA's English language proficiency standards that illustrate the demands of core content area classrooms. The notion that we must explicitly teach academic language within all school classrooms is gaining ground today. Gone are the assumptions of language learning "by osmosis" or that a specialized language arts curriculum alone can provide what ELLs need. Even under the best of classroom circumstances where teachers use a variety of student-centered methodologies, there is still a role for developing meta-awareness of academic languages. To engage students in this kind of intellectual work, teachers have to develop awareness of language and the ways that language is uniquely employed within their class and across different academic subjects. Such attention to academic language helps ELLs access the core school curriculum, but it also supports any learner who struggles with the discourses of school. This guide is packed with ideas for purposeful and differentiated language instruction and assessment that can be applied throughout most content classrooms. It provides a guide for any teacher who is eager to assure that students are learning deeply. I predict this text will be as popular with teachers already facing the daily challenges of educating ELLs as it will be in unversity teacher preservice programs. As teachers read it and make use of the strategies, they will begin to share the excitement I felt at finally seeing a guide that addresses language differentiation for ELLs.